It's a results-based business. And Orioles manager Buck Showalter—who, if he doesn't precisely rely on his hunches, at least tends to make decisions questionable enough that you notice they were decisions at all—finally has a playoff series win to call his own. This will be Showalter's first league championships series in four tries. In 1995, he took the Yankees out to a 2-0 lead in the very first year of the division series, before collapsing in heartbreaking fashion to Seattle. In 1999, his 100-win Diamondbacks lost in four games to the Mets. In 2012, his Orioles won the play-in game before falling to the Yankees in five. What does it feel like to finally, finally advance? "I got one in Albany," Showalter noted, referring to the 1989 double-A Albany-Colonie Yankees. Your first major-league series win, a reporter clarified. "They're all relevant," Showalter said. OK, but some are more relevant than others. Like taking three straight games from the Tigers, who were able to send Max Scherzer, Justin Verlander, and David Price to the mound in three consecutive games. To counter in the clincher, the Orioles turned to Bud Norris, acquired at last year's trade deadline from Houston, where he had never pitched for a winning team. Yesterday, he outdueled Price with six and a third innings of one-hit ball. Showalter didn't decide on Norris as his Game 3 starter until Friday, and it sounds like the Orioles manager was counting on Norris not having too much time to consider what he was getting into. "Today was my first day getting out there, different beast," Norris said. "Something I can't wrap my head around right now. I'm sure it will soak in the next couple of days. But it's just something we played since we were kids..."I was excited to have my number called and go out there and play. You got adrenaline and same thing, 60 feet, six inches." After taking three straight games from the last three AL Cy Young Award winners, Showalter had this to say of giving Norris the start: "Just because someone hasn't had the opportunity to do something before doesn't mean they can't do it." To bookend the clincher with another big decision, Showalter made the call to intentionally walk Nick Castellanos with one out in the ninth and the lead cut to 2-1. Closer Zach Britton has been lights-out this year, but had surrendered back-to-back doubles to start the ninth and get the Detroit crowd was back into things. Still, Showalter put the winning run on base. Conventional wisdom? 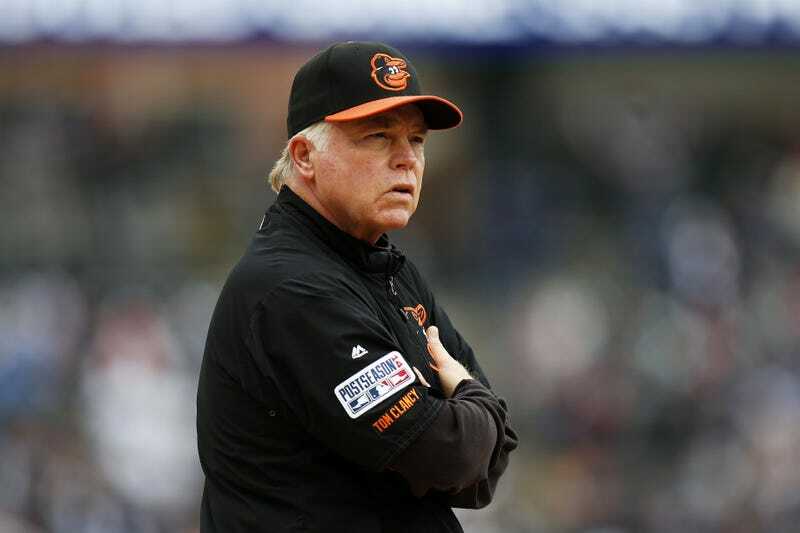 Showalter's wisdom—with the benefit of hindsight, naturally—makes his decision seem obvious. Britton's turbo sinker, which sits solidly in the 90s and which he finally put together as a devastating out pitch this past winter, is designed to induce ground balls. "Had a lot of faith in Zach," Showalter said of the call to walk Castellanos. "Played to the strength of our guys." There were no questions asked — only orders given and statements made. "We're going to walk this guy," Buck Showalter said to the six Baltimore Orioles he had gathered on the Comerica Park pitcher's mound in the ninth inning of Game 3 of the American League Division Series. "The next guy's going to hit into a double play, and we're gonna go home." In its way—and maybe this is just after-the-fact athlete talk—the intentional walk was a self-fulfilling prophecy for Britton. "I thought it was great," Britton said. "I was on the same page as him right there. You set up the double play. With how many ground balls I can get and how good our defense is, I think you've got to take the risk that I'm going to get a ground ball right there. Knowing that Buck had the confidence that I could do it allowed me to focus in a little bit more and make a good pitch." The Tigers sent up Hernan Perez, who had just five at-bats in the regular season and was on the roster, Brad Ausmus said, to hit against the Orioles' lefties. Like Britton. That Showalter's decisions paid off here doesn't necessarily mean they were smart decisions—though the fact that they've been paying off all series and all season tends to point in that direction—it just means, tautologically, that they were good decisions. That's often more than enough for October, which is much shorter than it feels. Three wins down for these Orioles, eight more to go—the next potential four pitting Showalter against Ned Yost, which projects to a mismatch. Showalter was asked what winning his first playoff series actually achieved. His answer, of course, was that it's chance to make even more fateful decisions. "It means we won an opportunity," Showalter said. "Basically what you won is an opportunity to keep rolling the dice."